Since he just had his face and scalp operated on, Rory wasn't in the best of moods and didn't particularly want to be photographed during the past day and a half. His entire head was wrapped with just a small space for his face to peek through. A big clump of hair stuck straight up out of the top of the wrappings (just picture the Grinch or the Invisible Man). Just a few minutes ago, we unwrapped his head and he looks great! I'm surprised that there is not more swelling and bruising. 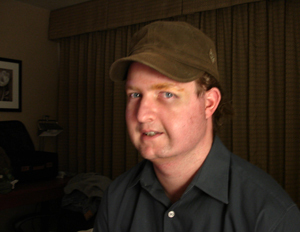 He has staples in his scalp from the eyebrow lift to correct the sagging caused by Rombergs. A new incision was made in front of his ear right on the site of the original incision for his free-flap transfer, which was done a couple years ago. No showers allowed for another day, so he's making do with a hat. He looks great! If you want to know more about Parry-Romberg Syndrome, take a look at this excellent website. Tomorrow's surgery will help shape the side of Rory's face affected by Parry-Romberg Syndrome (PRS). Thanks to a free-flap transfer at the UCLA Med Center a few years ago, he has plenty of tissue for this procedure. Bone in his cheek was affected while the condition was active and Rory previously underwent a bone graft with this same physician. Rory's PRS is inactive now (hooray!) and it is time to get everything shaped up. We're in Santa Monica for the outpatient procedure. By the way, The Romberg's Connection is a lifeline for people affected by PRS, and their friends and families. It's the day before Rory's 6th surgery related to Parry-Romberg's Syndrome and we're looking forward to getting his flap "de-bulked." More on that later. 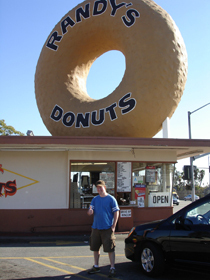 This morning we spotted the world-famous landmark, Randy's Donuts, while driving down Manchester Av. near LAX. Remember it from Earth Girls are Easy and Coming to America? This place has been featured in countless commercials and music videos as well. Although supposedly Randy no longer owns the business, someone who looked remarkably like him waited on us and he asked all about the icy Chicago weather. Randy's is packed with every kind of donut imaginable and you just step up to the window to order, like a Dairy Queen. Out of all those choices, I got a glazed and it was tasty! If you want to know more about Parry-Romberg Syndrome, take a look at this excellent website. While living in Los Angeles for a couple years after college, Rory had a free-flap transfer procedure. Tissue was taken out of his back and put into his cheek in a procedure that took something like 12 hours. What an ordeal, but he handled it like a trooper! At his follow-up appt. to get the drain taken out of his back, I asked Rory to pose in front of the sign at the hospital. One afternoon the following week, we took the short drive to Long Beach to see the Queen Mary, where we were convinced that we had photographed ghosts. Took some pics with blurry white spots, but later found out that they were the result of the flash bouncing off dust particles. Will find those pictures and post them here one of these days! If you want to know more about Parry-Romberg Syndrome, take a look at this excellent website.